Learn watercolour painting in a relaxed environment with a small group of watercolour enthusiasts. 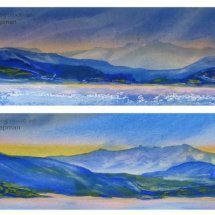 Learn tonal variation, types of watercolour brushes, types of watercolour paint, focal point placement, and take home a watercolour landscape painting of your own. Everything is supplied: professional quality paint, 4 types of watercolour brushes, watercolour palette, professional watercolour paper (rough and smooth), support boards and everything you need to paint in watercolour.